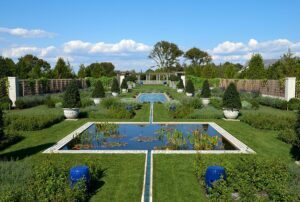 The Blue Garden, an historic treasure designed by Frederick Law Olmsted Jr., opened in 1918 with a flourish of celebrity. Once famous for its architectural and horticultural riches, the garden was almost forgotten by the early twenty-first century. The unique palette of blues and purples had become subsumed under a thick covering of weeds and invasive trees. This lecture, by The Blue Garden director Sarah Vance, will present the story of how the restoration team, inspired by archived materials from the original creators of the garden, reinterpreted the design and rebuilt the garden in all its glory while meeting contemporary sustainable standards. See link for registration information.